Dwarf, spreading ‘cushions’ of foliage become smothered in intensely fragrant, small, cross-shaped blooms. Superb with blue Crystal Palace lobelia. Easy to grow. HA/HHA - Hardy annual/Half hardy annual. Height 10cm (4”). Do you like fragrance in the garden? Then grow this easy to grow annual that can flower in as little as six weeks from sowing! Sow February-March indoors for container plantings or direct outdoors April-May for general use. 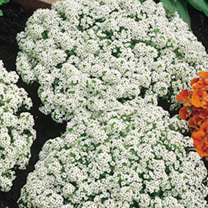 Great as an edging or in colour swathes. Suggested planting distance 15cm (6”). Use in patio containers to appreciate the fragrance.